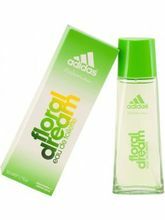 Adidas is a company that immediately flashes in the mind of anyone, who is a sports freak or loves wearing fragrances. It was registered on 18th August, 1949 by Adolf Dassler and it completely stands true to the notion 'Dreams do come true'. The company was started in his mother's wash kitchen and now the sky is its limit. It is recognized as an international brand and there is not a single kid you will find, who isn't aware of the brand. The brand has manufactured over thousands of aroma to suit the taste of every person. With its endless innovations in every field, it strives to deliver the best under any circumstances and make the world stronger and healthier. There are myriad choices to choose from like Adidas Pure Lightness Edt Eau de Toilette is explicitly for woman, who love mild, pleasing yet long lasting fragrance, where as a man, who prefers strong smell, the Adidas Deep Energy EDT is an ideal one. Choose the one you love from our assemblage!